I was so tired I almost didn’t go to our Tuesday sketch night but our destination, El Cerrito Natural Grocery, was near home so I pushed myself out the door. I only managed the sketch above, made standing using a shopping cart as my table. Even the colors looked tired. 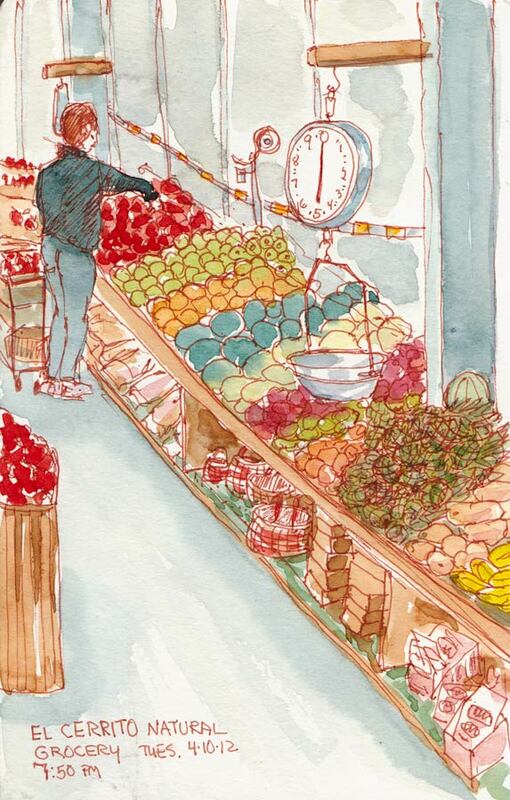 Cathy focused on the meat department and entertained the butchers with her drawings of them. Her chicken sketch is a hoot. Thank goodness I always put a note on the first page of every journal: “IF LOST PLEASE CALL…” with my phone number. I said I was still in the parking lot and ran back to the front door and gratefully took it home. This was another drawing while tired. I tried taking a walk to Peet’s coffee to wake myself up. Since caffeine is no longer an option, the walking and an iced decaf had to do the trick. It didn’t. I was just more tired when I got home but at least I got to sketch a bit (and didn’t lose my sketchbook this time). 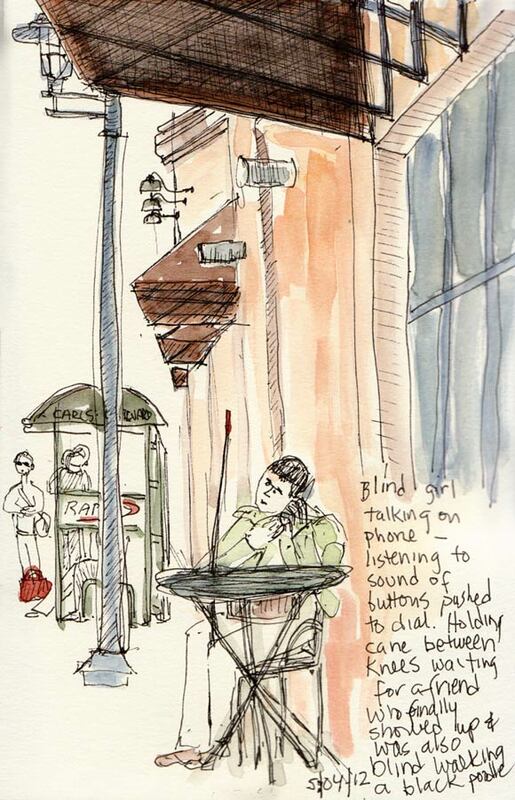 I watched the blind woman at the next table (in the sketch above) make a phone call by listening carefully to the tone as she pushed each number. Her friend arrived shortly afterwards, also blind, walking a large black poodle. If you’re meeting someone and you can’t see them, how do you know they’re there or arriving without calling out “Susie are you here…” or phoning? Why don’t you ever see standard poodles as guide dogs? I live near a center for the blind and also often see people training guide dogs on our subway system. They’re never poodles. Though they do always wear very cute booties–I wonder why? I am going to write my phone number in my books now! Why did it never occur to me before? Love your thoughts about blind people. Just don’t understand either. I have a friend, a woman of about 50, blind from birth who just KNOWS you are there. It should be creepy but it isn’t.. One last thought. do all US guide dogs wear cute little bootees? Never seen it here in UK. P.S. That’s really interesting to learn that your friend “just KNOWS” you’re there. Love the tired drawings… I believe that guide dogs wear booties because they most often walked on paved surfaces rather than softer ground or grass. Oh, I love your “sketches while tired”! I would never know that the colors were not vibrant enough and I find this scene very charming. Is your tiredness temporary, I hope? I always get very frustrated with myself and my results when tired. Your tiredness doesn’t show in neither of your sketches. I’ve never seen booties on guide dogs for the blind – but I’m also from Uk, definitely not hot pavements there.